The Cumbres and Toltec gallery and video are the result of a fantastic afternoon and morning spent on the Cumbres and Toltec Scenic Railroad this fall. I spent the rest of the afternoon at the Chama engine house. When the sun finally set, I called it a day and met Mrs. Frog at Foster’s for a chile-laden dinner. Saturday morning broke clear and crisp, and made for an excellent shot at First Crossing. We caught the train at a few more locations. We had to turn back because reality in the form of the flight home was looming over us. For those of you curious about the video, here’s the story. I looked over at Mrs. Frog, handed her my iPhone and asked her to shoot some videos. For a first effort, and without a tripod, I believe she did a great job! One of the things about the video is the sound. The sound on this is quite good, even capturing the echos in the valleys. It’s great just to listen to as well! If you want to see narrow gauge steam running much as it was until it was abandoned, it’s hard beat the Cumbres and Toltec. Yes, the Durango and Silverton Narrow Gauge is a few hours away. It’s a great ride as well – it’s just a little harder to view and photograph. If you haven’t done either, put them on your list to ride and photograph. Be sure to check out the Cumbres and Toltec gallery and video, and also our 2018 Holiday Sales! Yes, I know, the blog has been neglected this year. I hope you’re all still out there! It’s been a very busy year with a lot happening in the day job and life in general. For those of you that are on Instagram / Facebook and Google+, I’ve been posting there often @laughingfrogimages simply because it’s simple to do it from my phone wherever I am. I’ve been working on some new galleries for a while. One is of an epic trip to Manitoba to see polar bears and beluga whales while they’re still visiting Churchill. I hope that continues for a long time, but things are changing and we opted to go while the getting is good. Another is of night shots of trains dating back to the late 1970s. It’s my goal to get back to blogging, if only once a week. There are stories to tell of Churchill and of Manitoba, let alone individual images. Just need some time and some life in my work-life balance. As if I didn’t already have enough going on, my Marketing Advisor (Mike at Visceral Concepts) has finally convinced me to take on more things to do. Why did the Frog take the leap? (Go ahead and groan, but I couldn’t resist that!) Simple. I can post from an Ipad or from my phone in a minute or less, and it’s about getting the word out about Laughing Frog Images and the great images and products we offer for sale. I’m aiming for a post a day, and the same dry humor will be there, along with the stories and photography tips you’ve become accustomed to. So, what’s with Instagram and TLRs? It’s actually been fun preparing images in square format for Instagram – it’s like shooting with a TLR again! A TLR is a Twin Lens Reflex camera that most commonly made film images in a square format – typically 2.25″ x 2.25″. I have two TLRs that I haven’t used in a long time – a Mamiyaflex and a Mamiya C220. As I sit here and type this, I’m wondering why I haven’t. They’re not convenient. They’re best used on a tripod. They have no exposure meter. You have to focus manually. The image is backwards on the focusing screen. There are no zoom lenses. You have to wind the film – there’s no such thing as burst mode. Frames per second isn’t relevant – it’s frames per minute. And, you have to think! 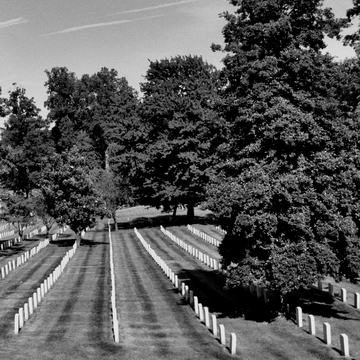 Yes, I love my digital SLRs, and my Icon – but the TLR – well, that’s photography! So where’s the fun in Instagram? Well, for starters, I have to reimagine image as a square image. That means cropping about one third of the image and tossing it. Sometimes, the image is reborn with new meaning or context in the process. Sometime, square is better. It’s like looking at the shot all over again, despite the fact that I may have made the original image over 30 years ago. Refreshing. Provocative. Fun! Well I can’t say that the TLR camera has in fact been reborn via Instagram, I can say that its’ spirit has been rekindled. It’s OK to think square again! Sadly, not all is good. There’s one drawback to all of this. Instagram cross-posts to the Laughing Frog Images Facebook page, but it doesn’t cross-post to our Google + page. I invite our followers and viewers on Google + to follow us on Instagram. There’s more metal on Laughing Frog Images! Some of you may recall that there were some changes made in the available products here at Laughing Frog Images – and some of the metal print sizes were discontinued. That was due to a change at one of the Frog’s partners. Well, if you were disappointed like the Frog was, despair no more – they’re back! 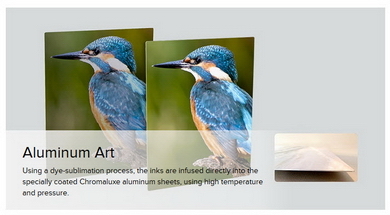 Aluminum Art is available again in sizes from 5″x7″ to 30″x40″. This compliments the Modern Metals available from 8″x10″ to 20″x30″. It’s hard to show you just what a metal print looks like. It’s even harder to tell you in the written word. For what it’s worth, most of the prints that I have on display at home are metal prints because the color just “pops” (I don’t know if there is a better word and I can’t find a better word). I have four 10″x20″ prints displayed in a bathroom. People spend more time in the bathroom than you might think is normal because of them. Want to know which ones? Click here, here, here and here to see them. Another great thing about metal prints is that they don’t need a frame. They’re also bathroom and kitchen safe because they are metal! Things are really busy in life right now, and will continue to be so over the next few weeks – so don’t be surprised if it’s quiet around here for a little while. I am working on several new gallery projects, and none of them is small. One is a gallery of a ride on the White Pass & Yukon from back in 2006 – and it starts out at over 300 images. Another is a ride on Via Rail Canada’s Canadian from Toronto to Vancouver – that one starts with over 1000 images. Then, there’s the eastbound and westbound journeys on the Feather River Express (two separate galleries that will have a bit of a twist). They are all epic journeys in their own right, and even more so if you are a railfan. All galleries will be in chronological order to give you an experience as close to being there as I can. Until next time… Be well. This is a happy birthday shout-out to Michael McNew of Visceral Concepts. He’s the behind the scenes guy who makes Laughing Frog Images work on the web – which makes me look professional and put together. Check out Visceral Concepts if you need branding, marketing, web services, IT support, and whatever else it is that he does that I don’t know or understand…! 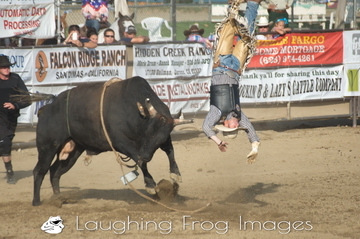 San Dimas Rodeo 2010 is just what it says – a gallery from the 2010 San Dimas, CA Rodeo. I’m not going to rehash everything I said about the 2015 event in a past post – just click here if you want to read about the rodeo and here if you want to go straight to the San Dimas Rodeo2015 gallery. Like the 2015 gallery, it’s all view only so I don’t run into any issues with releases, licensing, etc. As such, all of the images are straight from the camera. It’s here for your enjoyment – and hopefully, you’ll check out some other galleries on Laughing Frog Images and perhaps buy a print or two to make you smile when you look at it (or cover up a hole in the wall!). Think this might leave a mark? San Dimas Rodeo 2010. San Dimas, CA. I’d love to say that I got this image because I’m such a fantastic and skilled photographer (well, I might be something close to that, or so some might say). The reality is that to get an image like this, several things have to come together. The right lens helps. So does the right angle – as you can never predict which way a bull is going to go, the right angle is really a bit of luck. The right lighting helps – I sat where I sat for optimal lighting, at least as long as the bull tossed the rider in the right direction, so perhaps the right lighting is a little bit of luck. Timing – well, one can argue that’s either skill or luck. Then, beyond the lens, and the lighting, and the timing, you need the event itself. That moment in time where it all comes together. That day in October 2010, it all came together for this perhaps once in a lifetime image. Yes, it’s been quiet on here lately. Amazing how fast a month can go by. It’s not as easy as it seems it would or should be to work, do things around the house, do things with the family, run errands, etc., etc., etc., AND keep up with a web store and a blog. At least not for me, anyway. We’re not road kill. Just busy. I’m going to try to schedule a bunch of posts this weekend on a variety of subjects (actually, “last weekend” by the time you read this). Whatever it takes to get y’all to “like”, “share”, “follow”, and buy (remember, there’s a web gallery and store, too!). Things are really busy at the day job – so I’ll apologize in advance if there are some more gaps in the coming months. I could probably post daily if I won the lottery… If there are any multi-million dollar winners out there who want to adopt a frog, give me a ribbit! We’ve probably all been there before – you think you’re prepared for what you’re going to be shooting, and then reality decides to toss you a curve – and, sometimes, your lens is too short. It seems that when this happens, it simply doesn’t matter which lens you have with you. I’ve had this happen on days when I’ve had a 500mm lens and a 2X teleconverter with me. It’s just the way things go sometimes. In this case, I was on the north shore of Kauai, and there was what we think was a juvenile Humpback heading east and breaching several times. Why, we’ll never know – but you can learn more about humpbacks breaching here. Those of us that were there would prefer to believe that this was happy breaching on a beautiful day. So, while us humans were there taking in the spectacle, jaws agape, I decided to pick up my camera a snag a shot. And I did. With an 18-270mm fully zoomed out. Which was fine for the scenic images that I had planned to be shooting. 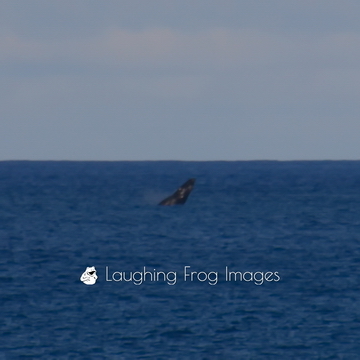 To say that the lens was grossly inadequate for breaching whales is a minor understatement. Without cropping, the whale looked like a black dot on a blue rippled background. So I cropped the image. A lot. Just to prove that I got a shot. Notice I did not say “THE” shot, I said “a” (note the lower case) shot. Is it a killer shot that’s going to grace my wall? Nope, not even close. Is it going to be my conversation-inspiring screensaver on my computer or phone? Nope, not even that good. So, why did I keep it? Because sometimes, it’s not about THE shot, or the quality of a shot that matters. Sometimes, all that matters is that you got A shot that makes you smile and think back to what was happening at that moment in time. And, sometimes, that’s all that really matters. Sometimes, your lens is too short. A Pacific Humpback whale breeches near Kilauea Point. Kauai, HI. You can check out more whale shots here on Laughing Frog Images.